About Us - Perform For Life: What is Perform For Life and what do we offer? What is Perform For Life? Following a decade of theatre school and youth theatre work, we took our very own first steps into the Arts Education world in June 2015. We ran bespoke sessions in schools, holiday workshops, weekday evening and weekend classes. Fast forward to early 2017, when Perform For Life was formed. Our sessions are industry-standard, and create an environment in which students can feel happy, encouraged and supported – while also being challenged. All students prepare annually for a Performing Arts exam with either LAMDA and Trinity College London. This is done on either a solo, duo, small or large group basis – whatever best suits / is preferred by the student. We have a 100% pass rate, with the majority of pupils gaining a High Merit or Distinction. Have a look at our LAMDA & Trinity exams at Perform For Life page for more information, and a list of some of the benefits of working towards an exam. Students join sessions for the exam best suited to them. Therefore, the content will always be built around their strengths, interests and needs. Students will never be placed in a session for an exam they are not comfortable with. 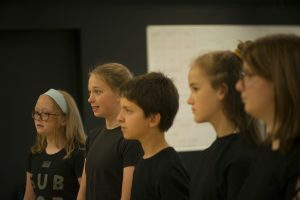 Students spend a part of the year working on existing repertoire and experiencing being directed by tutors. However, another chunk of the year is used for creative time. This could range from devising an original show, to themed songwriting and choreographing. This gives the students a chance to stretch their imaginations and convert their ideas to reality. It also gives them a sense of ownership. Have a look at our Our Belief & Approach and Locations pages to find out more. Perform For Life delivers after-school and solo / duo / small group sessions in a small number of schools in Bristol. Have a look at our Schools page for more information.